After reaching its historical peak at 67.1 percent in 2000, the labor force participation rate for all workers (age 16 and over) is projected to decline to 61.0 percent in 2026, according to the Bureau of Labor Statistics. The decline in the rate is largely the result of the aging population, as more and more workers move into higher age groups that tend to have lower participation rates. The overall labor force participation rate has been declining since 2000, dropping sharply following the 2007–09 recession and reaching 62.8 percent in 2016. The continued shift of the population into older age groups will have long-lasting effects on the labor force and the overall labor force participation rate. In 1996, the entire baby-boom generation was in the 25-to-54-year-old group, with a labor force participation rate of 83.8 percent. In 2001, the first of the baby boomers moved into the 55-and-older age group. Although the 25-to-54-year-old group shows the strongest attachment to the labor market, its participation rate has been gradually declining since 2000 and is expected to change little over the coming decade. 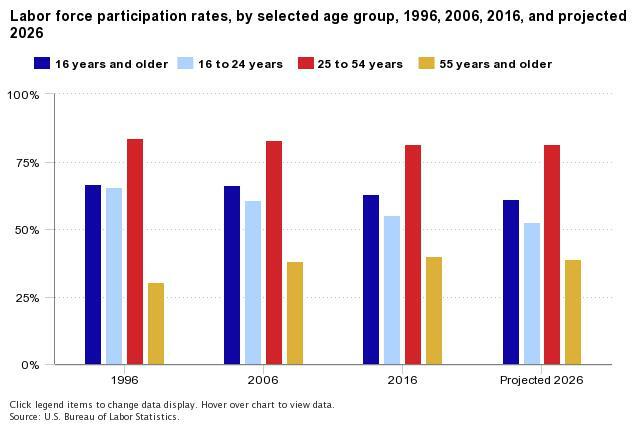 The participation rates of both 16-to-19-year-olds and 20-to-24-year-olds have decreased sharply over the past several decades. Their rates are expected to decline further, although at a slower rate. These data are from the BLS Employment Projections program. For more information, see “Projections overview and highlights, 2016–26,” by T. Alan Lacey, Mitra Toossi, Kevin S. Dubina, and Andrea B. Gensler, Monthly Labor Review.